HomeStuffsThe Best Fairy Tail Merchandise, Accessories and Stuff on Amazon	No ratings yet. Fairy Tail is one of the popular manga and anime series, both in Japan and worldwide. So, as a fan maybe this Fairy Tail merchandise could fulfill your need! It’s also be a great gift for your friends, boy/girlfriend, or your children. 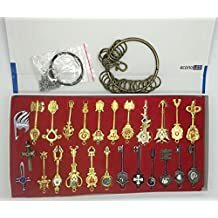 These are the best and recommended Fairy Tail merchandise, accessories and stuff that we picked from Amazon! If you’re not familiar yet, you can read our Fairy Tail review, or you can also make your own Fairy Tail cosplay in tutorial section. Sold by Econoled, this Lucy Heartfilia keys set is including 25 pcs keychain set. It’s suitable for you cosplay or good gift for any both of Lucy and Fairy Tail lovers. It is made of alloy material. They are extremely small but for the price they still make a great gift or cosplay item. The metal is very nice, they actually make this cool sound when lightly knocked against one of the other keys. The faux velvet seating they are in isn’t super great, it doesn’t keep the keys in place extremely well but as long as the box is kept in a still place it should be fine to just open up and show off. The best and recommended Fairy Tail merchandise for you! Sold by OliaDesign, this keychain set featuring Lucy, Erza, Natsu, Gray, and also two cute series mascots, Nikora and Happy. The figure has tall around under 2 inches and the package comes with all these 6 figures. 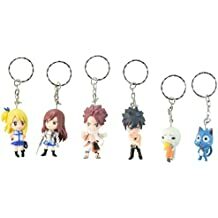 They are actually keychain and really cute ones for any Fairy Tail lovers and fans. They’re so tiny, but they look great! They were cheap and they’re reasonably detailed for something this price. Another recommended Fairy Tail merchandise keychain for you! Sold by Telacos, this Fairy Tail shoes sneakers are made of high quality canvas and rubber. Try to put it below the sunlight, then it can light in dark place. Nice paint job, very comfy. Any Otaku or anime lover would like these. 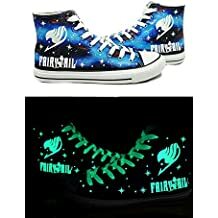 So, if you want to wear some catchy and cool shoes with Fairy Tail-themed, then this shoes will be one of our recommended Fairy Tail merchandise for you. Sold by Merchandise24/7, this mug will be great item for you! As you know that mug is one of the closest stuff for you to drink your favorite beverage, such as hot chocolate in the winter. 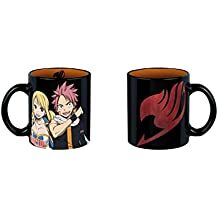 So, it’s better if your mug is as stylish as it can, like featuring your favorite characters from Fairy Tail, Lucy and Natsu. And also, this mug could be the great gift for your friend or children who love anime! They will definitely happy to get this kind of gift! Perfect Fairy Tail merchandise gift for any anime lovers! Very recommended. 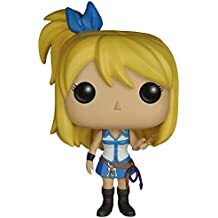 Sold by Funko, Lucy Heartfilia is now available on pop vinyl by Funko. She stands around 3,75 inches tall and would be the perfect items for any Fairy Tail fans. It looks perfect! The paint job is a little messy in some places but the over all attention to detail is amazing. The funko pop itself is very durable. So, we recommend this figure for any of Fairy Tail fans, or you can use it as a present or gift for someone who love both anime and Fairy Tail. This is really great Fairy Tail merchandise for you or your friends. Sold by GreatEastern, this Frosch Fairy Tail plush is officially licensed plush! It’s limited availability so make sure you get this cute plush! It’s so cute and collectible, soft and cuddly. It has approximately 5″L x 5″w x 8″H in size. This is absolutely high quality plush doll. And it will work for gift as well. It looks like to be constructed well, and has a great price. He is just as cute as the Frosch in the anime. 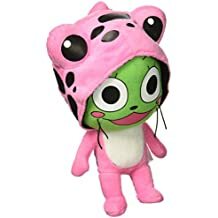 If you love Frosch you can’t go wrong with the plushie!!! Great Fairy Tail merchandise plush for you! 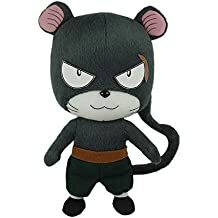 Sold by GreatEastern, this Nikora plush from Fairy Tail is officially licensed product by its seller. This plush is high quality and has great detail, and comes with official tag. This plush can be a great gift, too. It has approximately 3.5″L x 3″W x 7″H in size. It’s a small plush, but not too little that the details of the plush are unrecognizable. He’s even posed with his hands up. He’s soooooo cute!! You can’t help but want to snuggle with this cute little celestial plush!! Highly recommend this Fairy Tail merchandise plush to any series lovers or anime fans! 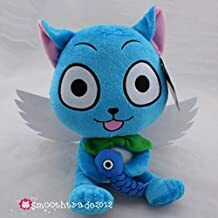 Sold by GreatEastern, this 100% toy Happy plush from Fairy Tail is officially licensed products! This product is really detail and high quality, comes with official tag. This product would be a great gift for any Fairy Tail fans. It has 5.5″L x 3″W x 8″H in size. The size is ideal for happy. It is as if Happy was plucked out from the show into real life. The plushie is perfect!!! It is made very well and is super soft. This is really cute and very close to the anime version. Get if you’re a Happy or Fairy Tail. This Happy plush is made of high quality soft plush item material. It has approximately 10″ in heigt. It’s really soft and cuddly with excellent condiiton, clean and nice. 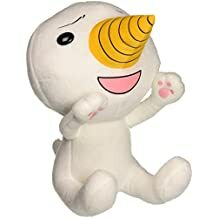 This is a really nice Happy plush. Surprisingly larger than expected! And very huggable! It is well constructed. Body is soft blue faux fur. Facial features are soft felt and stitching. Wings are stiff felt; a noticeable contrast to all the other softness. Fish details are printed. Overall, this plush is great for any Fairy Tail fans. Sold by Vanknight, this stickers was made of first class vinyl material, easy to stick and remove, plus no scratches left. The package includes 1x set of PS4 console decals for two-sided back and front, and 2x controllers decal. So, make sure to protect your console and controllers from dust and scratches. 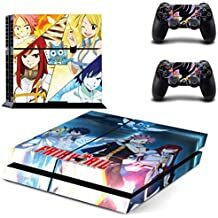 With Fairy Tail-themed, not only it can protect your console, but also it will give you an impression that you’re a huge fan of Fairy Tail. With cool designs, it features our main protagonist on Fairy Tail series. 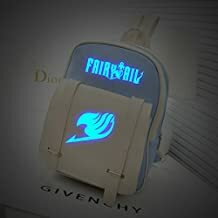 Really recommended Fairy Tail merchandise for PS4 owners who want to protect their “imagination”. Sold by Doppelganger33LTD, This Fairy Tail big poaster has 118.8 x 84 cm / 46.8 x 33 inch in size. It was made of high quality product with high quality fine detail reproduction print. It’s printed onto 250 GMS Matt paper. 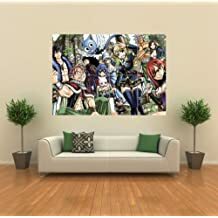 If you love Fairy Tail then you must have this poster! Awesome quality and nice color! You will love how big it too, it really looks great on your living room wall! So, go grab this poster! This is definitely a must have for any Fairy Tail lovers and Fairy Tail merchandise seekers. This product is suitable for iPhone 6 and iPhone 6S. Please note that it’s not fit with iPhone 6 Plus nor iPhone 6S Plus since they are really different in version. It is brand new and was made by high quality rubber material. Very convenient that easy to install and remove. This Fairy Tail iPhone case will give your device maximun protection because covers back and corners of your iPhone. 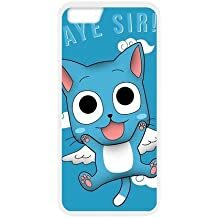 Also, this Fairy Tail iPhone case is featuring the best mascot of the series, Happy. The case is wonderful. It is really great. It’s very protective. Another recommended Fairy Tail merchandise for you! Sold by Siawasey, this Fairy Tail bag will change the color of the Logo in the evening after absorbing sunlight. It has 25cm L x 34 cm H x 10cm W in size. It was made of super high quality PU leather, and it will be a perfect bag for any anime and Fairy Tail fans! This could be a great gift for someone you love! Especially your children who love anime and Fairy Tail so much. Well, we recommend this cool Fairy Tail merchandise for you! Go grab this bag and make your children happy! 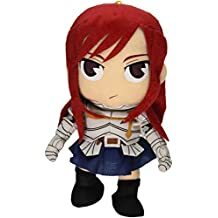 This Fairy tail Erza Scarlet plush is officially licensed by Great Eastern. She’s cute and collectible, really soft and so cuddly. She is super adorable and vary well made! It truly looks like erza from the anime. The hair is extremely soft and well stitched. Perfect quality material, not cheaply made that’s for sure. For the price it was worth seeing a smile on a very happy Fairy Tail merchandise fan. The armor is very nicely detailed, and the face and hair are so spot on, so you know exactly who you are holding in your hand the moment she arrives. Beautiful work of art. This Pantherlily Fairy Tail plush is officially licensed by Great Eastern. This product is extremely detailed and high quality which comes with official tag. It has approximately 4″ L x 3.5″ W x 7.5″ H in size. He looks just like the character, and the make is very good quality. If you want something big, this shouldn’t be what you get. It’s small, but great. Overall, this also be a great Fairy Tail merchandise for any fans! Make sure you get this plush! It’s also great for gift! 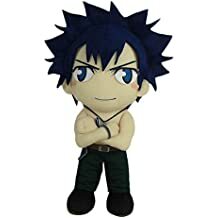 This Fairy Tail Gray Fullbuster plush is an officially licensed product by Great Eastern. This is high quality plush and very collectible. It’s also great for gift with approximately 3″ L x 2.5″ W x 8.5″ H in size. Gray Fullbuster is one of the main character from Fairy Tail series. So, make sure you own other main characters as well. He’s gonna be fit well with others. So, we recommend this Fairy Tail Gray Fullbuster plush for you! This is totally great Fairy Tail merchandise you can get on Amazon. 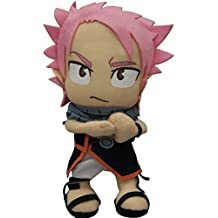 This Natsu Dragneel plush doll is officially licensed by Great Eastern. It’s really great in detail and hgih quality plush. It comes with official tag and great for gift. It has 3″L x 2″W x 8″H in size. This plushie adorable. It looks exactly like the picture they advertise. I don’t quite understand why the scarf is grey and not white like Natsu has, but it is still nice. He’s made of great material, & has wonderful durability. He’d be an amazing addition to anyone’s collection & I highly reccomend buying one of him for yourself! Any Fairy Tail fan would love this plushie, has a nice hook where the fan can hook it anywhere, and nice to collect. One of the great Faity Tail merchandise for you! 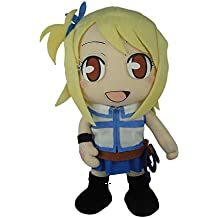 This Lucy Heartfilia Fairy Tail plush is an officially licensed by Great Eastern. It’s great detail and high quality plush which comes with official tag. Lucy Heartfillia also great for gift. It has 3″L x 2.5″W x 8″H in size. Lucy has such great detail, even comes with her little whip. Even has the guild emblem on hand. 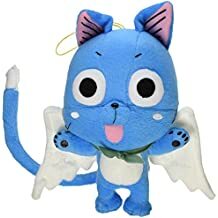 This plush could be a great item for any Fairy Tail fans. Make sure you get this Lucy Heartfillia plush doll if you are looking for Fairy Tail merchandise and collection. This Fairy Tail Happy Knitted Beanie is fully licensed product and made of quality material. It’s so comforatble fitting. This beanie is the bees knees!! The Material is soft like most beanies would feel like. Great for winter time. This hat is absolutely awesome! It is very warm and adorable. The fabric used seems like it will last long and is very soft. 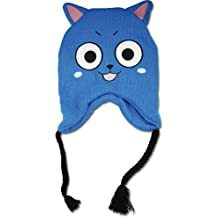 I highly recommend this to any other Fairy Tail Fans that check this hat out!!!!! Great Fairy Tail merchandise for you! 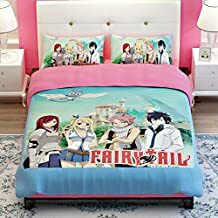 This will be a great Fairy Tail bedding set for children! It is made of polyester and cotton, give you soft and comfortable feeling. You get a duvet cover, pink flat sheet and two pillow cases. Everything about my bed spread was Perfect! Washes nice and easy too. The design is beautiful as well. Great Fairy Tail merchandise for your children who love anime and the series.